These are a few of my favorite Paleo dinner recipes, all of which are quick and easy for weeknight meal planning, and they save well for lunch leftovers (which is just about my favorite thing ever). All of these have a fair amount of veggies in them, but a little side salad never hurt anyone. Spaghetti Squash Spaghetti - One of my favorite recipes. It takes over an hour due to having to roast the spaghetti squash, but it is a great one to make in large batches and even freeze. I roast half of a spaghetti squash and wrap/freeze the other half for another time. It actually makes the squash a bit more moist. Shrimp + Sausage Paleo Skillet - Oh man, THIS. (Apparently I have a lot of favorites...) I use Spicy Italian Pork or Chicken Sausage from the Whole Foods meat counter (it is delish and compliant) but any sausage will do (just check those ingredients, a ton of sausage has sugar and a bunch of other random stuff in it). If you save this for leftovers later, just make sure you eat all the shrimp, it doesn't save as well. 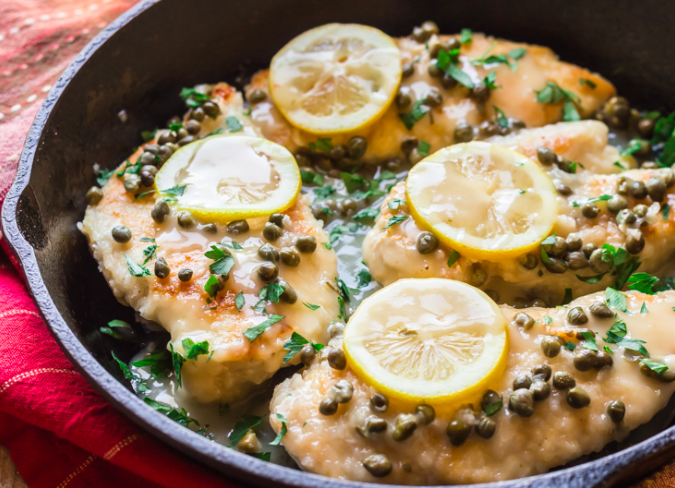 Chicken Piccata - Easy weekday recipe with so few ingredients. This is one of those that I can often make quickly because I already have everything the house. I use the chicken in my salad the following day for lunch. It might be even better cold. Salmon - We have salmon a couple times a month. I use a dill + salt + ghee (or butter….) and put it in the oven for about 20 minutes. I roast some brussel sprouts or asparagus (you could add cauliflower fried rice or potatoes if you want more). We don't eat too much fish, but it is great to have in the rotation due to the health benefits and how simple it is!